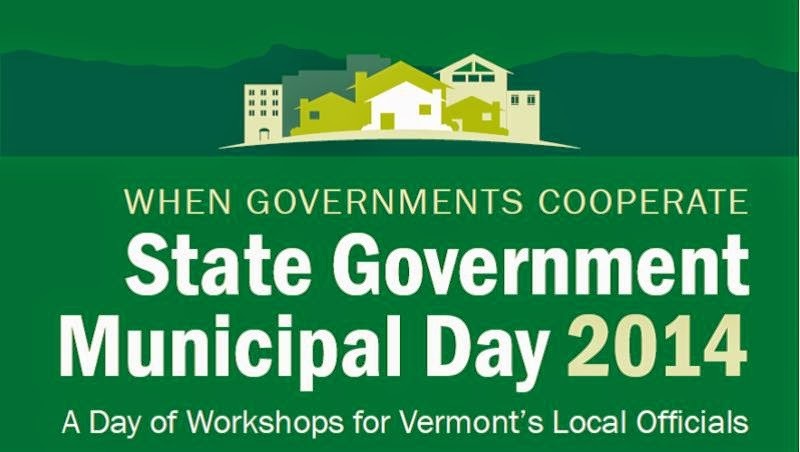 The Vermont Agency of Natural Resources (ANR), in cooperation with the Vermont Agency of Transportation (VTrans) and the Vermont Agency of Commerce and Community Development (ACCD), invite you to participate in When Governments Cooperate: State Government Municipal Day at the National Life Building in Montpelier, VT on Thursday, November 13, 2014. When Governments Cooperate: State Government Municipal Day is an all-day event that will include poster presentations, workshops, technical assistance and the opportunity to engage with Agency staff members and municipal colleagues from across the state. Space is limited and on-line pre-registration is required. The day begins with coffee and poster presentations followed by a kick-off plenary session at the National Life cafeteria. The plenary session will include remarks by Agency leadership for ANR, ACCD and VTrans where you’ll hear about the upcoming issues and opportunities we see for municipalities. Workshop sessions will run during the morning and afternoon. You must pre-register for workshops as seating is limited. The $30 registration fee includes morning coffee and a buffet-style lunch by the New England Culinary Institute at the National Life cafeteria. The event will take place from 8:00 am to 4:15 pm. 3. Road Ready: Are You Prepared for the Storm? 10. Town Forests Enrich Communities: Learn What They Can Do for You! 17. Natural Resource Inventories: Forest Blocks, Wildlife Corridors, Natural Communities, and Rare Species! 21. Do your Part, Be SepticSmart! Please click here to register and pay for Municipal Day November 2014. The workshops will be offered at the State offices on the National Life campus in Montpelier, Vermont. Parking information will be sent to registrants at a later date. Those who are interested in attending should RSVP by visiting https://www.efficiencyvermont.com/About-Us/three-year-plan or calling: 1-888-921-5990. RSVP is requested, but not required. For location details, please click here. Can’t make one of the forums, but still want to provide feedback? We’ll be posting an online survey next week – and encourage you to let us know if you would like us to visit your community or region as we continue our outreach. This post originally appeared on the Vermont Watershed Management Division’s blog, Flow. Please help us congratulate and celebrate the towns, conservation commissions, and VTrans who have mapped wetlands within their communities and along interstate highways and have provided those data for open access on our online Vermont Natural Resource Atlas! The town mapping data have not been reviewed in the field by the State Wetlands Program to determine wetland significance due to the vast land coverage, but the data are still useful to help with initial screening of potential wetland resources. Some significant wetlands may have been missed during town mapping, especially those under heavy forest cover, and therefore mapping should not be considered comprehensive. The state of Vermont recognizes wetlands as sensitive areas important for water quality, wildlife habitat, regional beauty, and other functions and values and this is why we are taking steps to try and make our public mapping inventory more informative and comprehensive by including town mapping data. You can access these town mapping data by going to the Vermont Wetlands Program Homepage http://www.watershedmanagement.vt.gov/wetlands.htm and clicking on “Wetlands Inventory Map” on the upper right hand side of the screen. The Wetlands Inventory Map Program will open (see picture below). The town mapping is already an activated sub-layer when you launch the Wetlands Inventory Map, depicted as the light green color shown in the map above. The sub-layer is specifically located under the Watershed Protection Layer, which can be seen if you open map layers on your screen. All layers and sub-layers can be turned on or off at will. The town mapping within the “Wetlands Advisory Layer” is non-regulatory. To view known state protected wetlands you will still need to view the Vermont Significant Wetlands Inventory (VSWI) maps, shown in yellow on the map above. This sub-layer, also under Watershed Protection, is activated when you open the Wetlands Inventory Map program. Many protected wetlands are not on the VSWI maps and they may or may not be included on town mapping. Wetlands which are not mapped may still be considered significant and protected under Vermont Law. Indicators for unmapped wetlands are hydric soils, flood hazard zones, standing water, and vernal pools. Often the identification and classification of a wetland requires the assistance of a professional to identify. Landowners are encouraged to contact their District Wetland Ecologist if they have questions regarding protected wetlands. Wetlands considered significant Class II wetlands are protected under the Vermont Wetland Rules (VWR). Any activity that is not an allowed use designated in §6 of the VWR requires a State Wetland Permit. The updated Rules of 2010 give characteristics of wetlands which should be presumed as significant Class II wetlands in §4.6. The wetland is of the same type and threshold size as those mapped on the VSWI maps: i.e. ; open water (pond); emergent marsh; shrub swamp; forested swamp; wet meadow; beaver pond or beaver meadow; bog or fen; or greater than 0.5 acres. The wetland contains woody vegetation and is adjacent to a stream, river or open body of water. The wetland contains dense, persistent non-woody vegetation and is adjacent to a stream, river or open body of water. The wetland is a vernal pool that provides amphibian breeding habitat. The wetland is a headwater wetland. The wetland is adjacent to impaired waters and the impairment is related to wetland water quality functions. The wetland contains a species that appears in the NNHP database as rare, threatened, endangered or uncommon; or is a natural community type that is rare or uncommon. The wetland has been previously designated as a significant wetland. It is within sixty (60) days after the landowner has received notice of a preliminary wetland determination pursuant to Section 8.1 of these rules. So, take a look at our new mapping layers and see what a difference town mapping data have made in identifying where our wetlands are within the Vermont landscape. If your town is not included, know that there are opportunities for map improvements. If you have any questions about wetlands, check out our website. We provide answers to frequently asked questions, definitions, landowner guides, best management practices, and links to our permit applications among other resources. Join the Association of Vermont Conservation Commissions on Saturday, November 1, for AVCC’s 2014 Annual Meeting/Conservation Summit! This energizing event is a great opportunity for conservation commission members and anyone else interested in conservation in Vermont to network, be inspired, and become even more effective voices for natural resource conservation at the local level. This year’s summit, which is chock full of a range of useful workshops and panels, will take place at Montpelier High School. The event is free for members, but there is a $10 charge to each attendee to help cover conference expenses. Non-members can join AVCC ($20 for individual membership, or $50 for a conservation commission) at the door. You can pre-register and pay ahead here (Important: please use the online membership form even if you are a member, and in the “Notes” space provided at the bottom of that form, tell us that you are registering for the AVCC 2014 summit). You can also pay at the door. How will Barre businesses bounce back from the next storm? The Vermont Economic Resiliency Initiative (VERI) will be working in Barre City and Barre Town to help minimize the risk of flooding and severe weather to Barre City and Barre Town businesses and infrastructure. VERI is hosting a community event for anyone who lives, works or owns a business in Barre City or Barre Town to identify risks in the area. For more detailed information about the VERI project, click here. Please RSVP by October 22, with Dan Currier at currier@cvregion.com or (802) 229-0389. Light refreshments will be provided.